Download the PPTs from the programme page. Europe is leading the world in the effort to make science more aware of and responsive to the consequences of gender inequality and gender bias in science practice and knowledge. The Summit programme advanced understanding of when, how and why gender issues in research can produce different outcomes for women and men, and, like its predecessors, it demonstrated important intellectual, societal and economic benefits of gender mainstreaming. The Summit took place in Berlin and preceded the Falling Walls celebration as a reminder that gender inequality is a ‘wall’ that also must fall. GS7 Europe will demonstrated how to apply the gender lens to improve effectiveness of research and innovation, and how to transform policy context through strategic, high-level policy alliances to enable lasting change to take place. 350 participants heard from 80 speakers focusing on The benefits of gender equal and gender sensitive research and innovation (Day 1) and Enhancing the capacity of policy actions to achieve lasting change (Day 2). Keep up to date via our newsletter and social media or email us. We are honoured that Cornelia Quennet-Thielen will open the GS7-Eu, the first European Summit to be held in Germany. 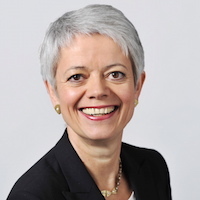 Cornelia Quennet-Thielen is State Secretary at the German Federal Ministry of Education and Research since 2008.